Some of my earliest clients were high volume restaurants on the New Jersey Shore. I noticed some key similarities among the successful operators. The very best started with a small operation on a relatively large area of land. Over time, they grew the restaurant's capacity with incremental additions. At their peak, these restaurants had many dining rooms and multiple kitchens. Some were found in the annual top 100 lists in industry publications. As I gained clients further north in the state, I advised them to try growing incrementally and talked some out of major unit expansion. Rather than enlarging the fixed cost base, I advised them to maximize their profit at existing locations. Since food service operations exist in a highly competitive environment, operating margins tend to be low. A restaurant operating at or near their break-even point will have a high degree of operating leverage. Any increase in sales volume beyond break-even will produce a significant increase in the bottom line. This leverage will decline as sales volumes increase over time. 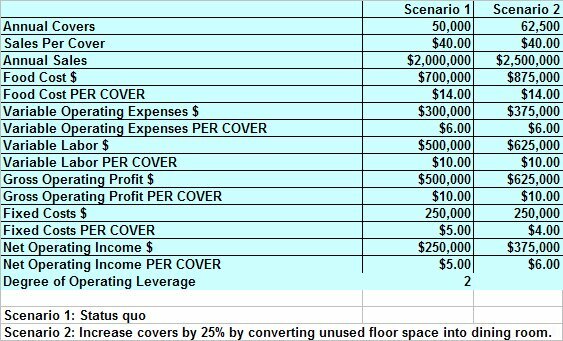 To illustrate the concept of degree of operating leverage, let's look at an example of a steak house concept doing 50,000 covers per year and an average sales per cover of $40. Their 35% food cost translates to $14 per cover, their variable labor is $10 per cover and direct operating expenses are $6 per cover. Fixed costs total $250,000. The degree of operating leverage at this point in time will equal 2. A 25% increase in sales will produce a 50% increase in profits. Rather than opening a new unit 20 miles away, the operators convert unused floor space into an additional dining room. The new seats fill quickly on busy nights and the room is closed early in the week. Covers increase by 25% to 62,500. 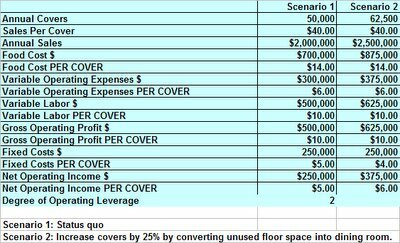 If all costs remain in line, profit will expand by 50% from $250,000 to $375,000. One of my clients expanded the dining area in the original restaurant three times before successfully opening a second location. The steady cash flow from the original site allowed him to take a bold move and he now has two high volume operations.